The Writing Bug: I Bought a WHAT?? 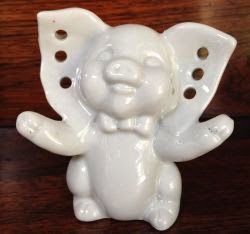 A few months ago, I was browsing in an antique store, and I noticed the cutest little milk glass elephant. He was sitting, had his front legs extended like an invitation for a hug, and had three little holes in each over-sized ear. He was three inches tall and adorable. Since I collect elephants, and, like I said, he was adorable, I purchased him. After he was washed, I placed him on my desk to the right of my computer screen. He was my writing buddy. The following day as I sat at my computer, I looked at my new little friend with admiration. My eyes focused on his face and I could not believe what I saw - he was NOT an elephant! He had a snout, not a trunk! I whispered, “I bought a PIG?!?!" I don’t like pigs! I immediately did not want him and I began plotting how I could return him. Then I thought how embarrassed I would feel to walk into the store and say: “I thought it was an elephant!” So, I just left him sitting there looking at me, smiling and offering a hug. After several days, still not mustering up the nerve to return the little alien, I felt ashamed of myself. Just because he wasn't what I thought he was, or what I wanted him to be, did not mean he was inferior. He was as cute as when I spotted him on the shelf. I had a stern visit with myself. My white ceramic pig now has a name, Harley. I would not trade him for the finest of elephants. He watches over me as I write, activates my brain, and keeps me humble. Harley came to me innocently, and shame on me for judging him as less valuable just because I didn't see him clearly. Such is discrimination in our world. If someone does not fit our criteria, for whatever reason, we often reject them and do not give them a chance. 1) What we do not want is often what we need. 2) We must learn to laugh at ourselves. 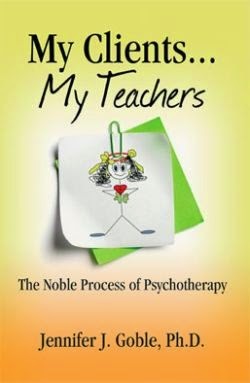 Jennifer Goble, Ph.D., a Licensed Professional Counselor, is author of My Clients…My Teachers: The Noble Process of Psychotherapy. Visit her blog at www.JenniferGoble.com, and her weekly Mental Matters column at www.southplattesentinel.com/health. I believe that's a flying pig. That is a great metaphor for the whole publication process. Has any author ever found it to be totally what they expected at first glance? You made me laugh out loud, Jennifer, and that's a great way to start the day. Harley will probably turn out to be one of your most treasured possessions as well as a valuable muse.